The following information is an extract from Healthy choices: food and drink classification guide (PDF). 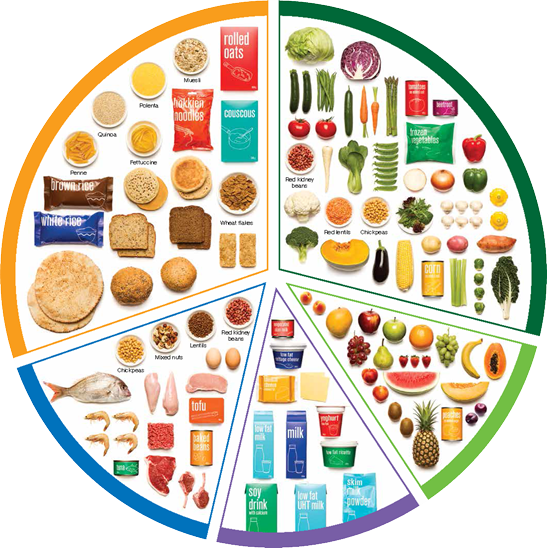 The Healthy Choices guidelines classify foods and drinks as GREEN, AMBER or RED based on their nutritional value. Foods and drinks in the GREEN (best choices) category are the healthiest choices. Water is also an important part of the GREEN category and should always be readily available. Some GREEN foods and drinks are even healthier than others. For example, wholegrain and white bread are both in the GREEN category, but wholegrain bread is higher in fibre and is a healthier choice. Offering GREEN foods and drinks in appropriate serve sizes is consistent with the recommendations in the Australian Dietary Guidelines. Below is a summary of foods and drinks in the GREEN category. For more GREEN choices refer to the Common foods and drinks classification guide, in the Healthy choices: food and drink classification guide (PDF), or find them on FoodChecker. Breakfast cereals that meet the GREEN criteria in Table 1 of the Healthy choices: food and drink classification guide (PDF) (page 18). Some commercial or freshly prepared ready to eat meals, mixed hot-food dishes or plated dinners that are lower in fat, salt and added sugar and use vegetables, legumes and beans, lean meats, wholegrains and reduced-fat cheeses. Pasta and simmer sauces, soups, dips, mayonnaise and salad dressings that meet the GREEN criteria in Table 1 of the Healthy choices: food and drink classification guide (PDF) (page 18). Offer a wide variety of GREEN choices. Ensure GREEN ingredients make up the majority of meals, snacks and drinks. Include GREEN choices across all menus and product categories. Make GREEN choices available for as much of the day as possible, including after hours and on public holidays. Promote GREEN choices in all situations where foods and drinks are offered. Ensure GREEN choices are attractively presented and competitively priced. Include GREEN choices in special offers such as meal deals, combos and loyalty cards. Place GREEN choices at eye level on shelves, in fridges and in vending machines. Display GREEN choices at the front of cabinets and bain maries. Place GREEN choices in high traffic areas.